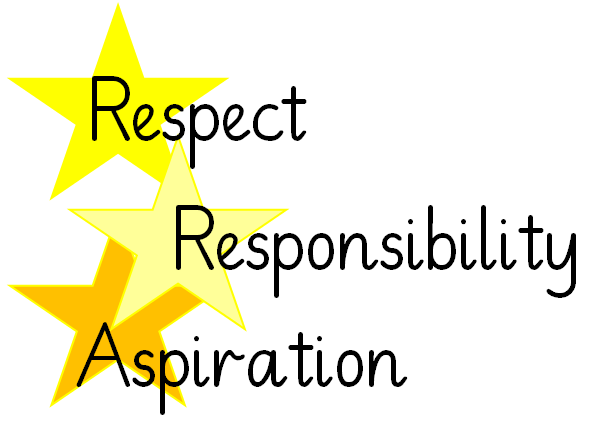 Our values of respect, responsibility and aspiration are the foundations our school is built on and feed directly into our golden rules. You will hear it in the language spoken by our staff and children. Children throughout our school can talk about these values and what they look like in action. They are run through our expectations of behaviour and are often quoted by children in their explanation as to why they reached the pinnacle of our ‘going for gold’ behaviour ladder. Our cycle of collective worship is centred around respect, responsibility and aspiration and all our displays will reflect these values in their presentation, content and ethos. Please feel free to talk more about these values with our pupils.